Tasting room visits are big business; they're play time for grownups. A new San Francisco company is betting on the idea that a tasting room visit is so much fun that people will want to do it in their own homes. And they're betting that you won't want to have any friends over. 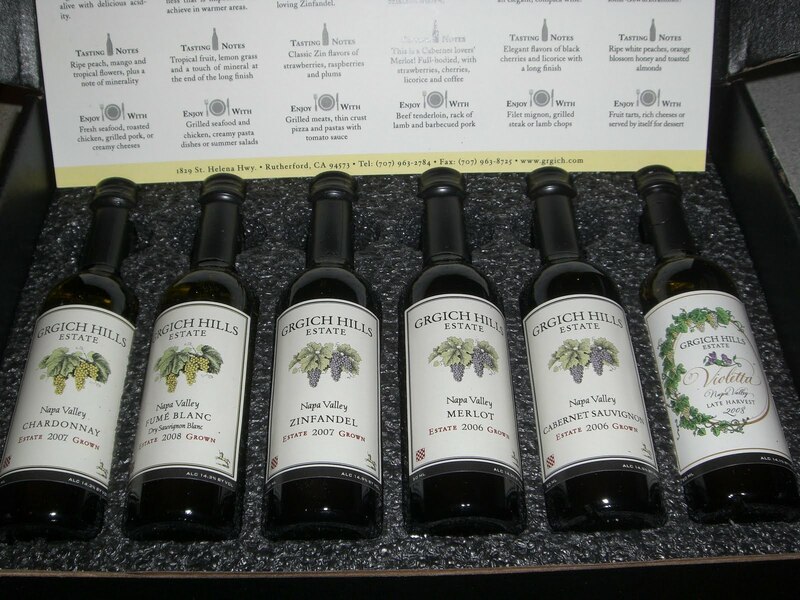 Tasting Room will ship you a box with 6 miniature 50 ml bottles of wines and a very short description of each. The idea is that you will enjoy the tasting so much that it's entertainment on its own. As a guy who tastes wine all the time, I had mixed feelings about it. There are wine tasting groups all over this country, where people get together with friends and open several bottles. They've sprung up organically, like book clubs, and work similarly. Somebody says, "Next week we're tasting Alto Adige wines," and everybody brings one. Can a private company improve on that communal experience? The answer depends on how much you like tasting with your friends. The Tasting Room is more commercial and by necessity more private. The wine arrived in good condition. The bottles are cute. And I do like tasting wine. There are two big downsides. 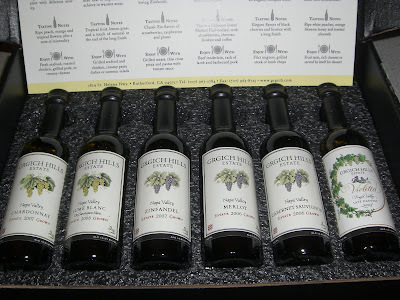 1) The boxes are pricey: the Grgich Hills sampler they sent me was $34.25 including taxes and shipping (note to FTC -- I didn't pay!) That's a lot for 300 ml total of wine -- the equivalent of $85 a bottle for a 750 ml bottle. Only one of the six samples in the bottle sells for that much. I did get a coupon for free shipping for my next order, which would cut the price by $6.95. 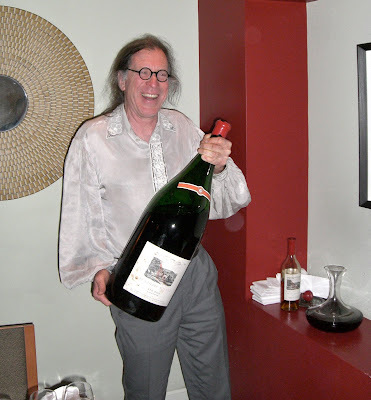 The size problem means Tasting Room.com is either a couples or a solitary experience. But there may be some utility for it in anniversaries, date night, etc. My wife, who sees me open a half-dozen regular-sized bottles for tasting all the time, was far more excited about the Tasting Room box. She loved the cute bottles. She took photos, she took notes. It was as if the tiny bottles brought the experience to a human scale she could enjoy. You can buy wines at a slight discount from the Tasting Room site. It's always a treat to taste Grgich's Chardonnays, and for us the 2007 Grgich Hills Napa Valley Chardonnay ($36) was the pick of the crop: toasty yet balanced, with vibrant fruit. Would I have rather just had a bottle of it? Possibly, but my wife preferred tasting little drips of 6 different wines, and since she's closer to being a normal wine consumer than I am, her experience is more valid. She enjoyed the experience just as the company intended. As for me, I mixed the Cab and the Merlot just to see if I'd like them better together (I did) -- something I only occasionally do with full-sized bottles. I thought I might mock the concept, but instead find myself telling you its proper use: as a couples' night thing, a fun event for a weekend. But keep in mind that the sampler contains only about two glasses of wine total. That might not keep you busy even as long as a real tasting room visit. But what the heck, it is date night, right? Rosenblum Cellars turned from winery into a brand this week, as its owner Diageo announced that it's closing the Rosenblum winery in Alameda. 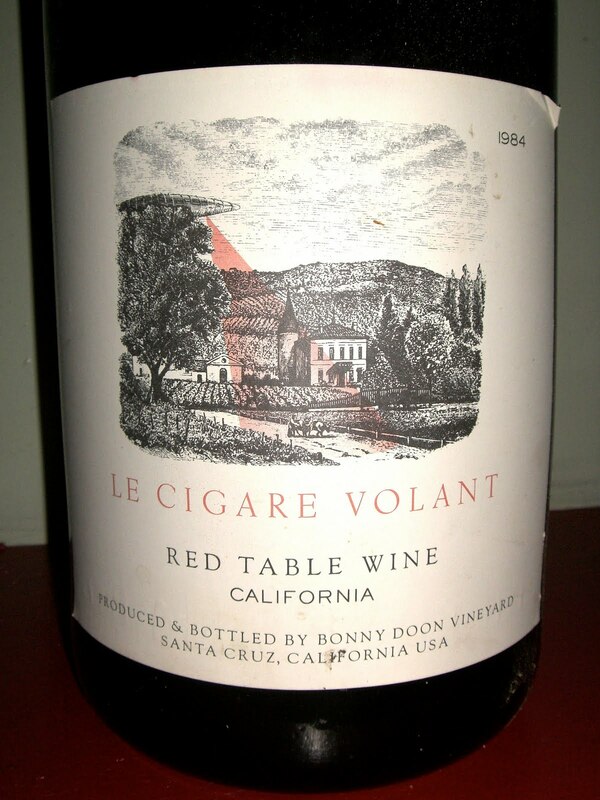 The move was inevitable after Kent Rosenblum sold the winery to Diageo in 2008. 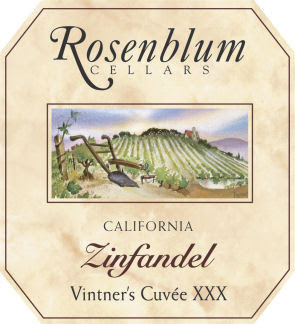 The reason a big company like Diageo buys a winery in the first place is not to make small lots of single-vineyard Zinfandel -- Rosenblum has already cut back on those. No, it's to sell a million cases of Rosenblum Vintners Cuvee Zinfandel in grocery stores around the country. There's nothing wrong with that; it's the model for success in the U.S. wine business, and I'm never going to tell a company to not make money. And Diageo makes better mass-market wine than some companies: its Provenance brand is particularly good. But as a wine lover, I don't want to drink a wine made by buying cheap grapes in the Central Valley, adding Mega Purple for color and reducing the alcohol to cut the tax bill. Yet that's what sells, and not just because it's cheap. You can buy a good, honest red wine from Spain or Portugal or Argentina for the same price as one of these generic "brands." Why do U.S. consumers want "brand" wines? There's an analogy to food. Wines like Turning Leaf are like Taco Bell, while Rosenblum is turning into Applebee's. People like the assurance of a familiar name. In many parts of the country, Taco Bell and Applebee's will drive Mary's Local Diner out of business. I'm a bad American; I have never eaten at Applebee's. I like comfort food, but I want to know that it's made in the kitchen from local ingredients, not prepared in a factory somewhere, freeze dried and microwaved in the back. I'm willing to accept variability in my food in pursuit of that locally cooked experience. If you feel the same way, you have to think about whether you want to buy mass-produced factory wine brands, or try something less uniform, even if you're not sure exactly how it's going to taste. I have been ignoring HR 5034, beer wholesalers' attempt at ensuring state monopolies, because I thought it's so obviously a bad bill for American consumers that it will never pass. I was right about it being a bad bill. Nobody benefits from this bill -- nobody -- except beer, wine and liquor distributors. Consumers lose, wineries lose. It's a classic product of corruption, the sort of law you expect in a third-world country where the president's brother owns the company that benefits. Whether you're a Tea Party tax hater or a Code Pink peacenik, it's a bill that's easy to hate. I was wrong about it having no chance. As of May 13, the bill has garnered 85 co-sponsors in the House, Democrats and Republicans both. 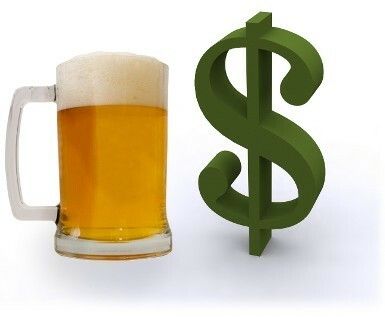 The reason is that beer distributors pour money on the House like a 4-year-old pours syrup on pancakes. It's an election year, so your House member needs cash to make TV commercials about how he's not one of those Washington insiders. So it's time for all of us who drink wine, beer, cocktails, anything with alcohol in it, to email our House representative and tell them, "We don't want this." As usual, Tom Wark has done the best summary of this bill, and it's here. In a nutshell, HR 5034 would make it more difficult for small wineries and breweries to get their products to consumers. Its impact would differ by state, and would be much worse in states where the legislature is more corrupt (New York) or more anti-alcohol (Pennsylvania). But by making life more difficult for small wineries, it would threaten their existence, and if you're a wine lover in any state, you don't want that. Here's a nifty site for contacting your House member by email. Just put in your home address and your house rep's and senators' email links pop up. If you want to see if your representative has already thanked the beer distributors for their cash by co-sponsoring the bill, here's a map of the corrupt 85, which I hope will be updated. And here is a short sample email. I have sent this to my Congressperson, Nancy Pelosi, who -- as a wine lover -- will hopefully vote against the bill. But Pelosi is a pragmatist: Democratic incumbents as well as Republicans need cash for November, and the beer distributors are standing there with an open checkbook. We can't trust her, or any member of Congress, to do what's best for consumers if we're not paying attention. An acquaintance told me that recently. As it turns out, that’s what every American believes -- although the numbers change for each person, according to a wine marketing guru I had the pleasure of dining with last week. Research has shown that American wine drinkers all have a price point where they feel comfortable, whether it’s $5 a bottle, $25 or $125. And at every price point, Americans think cheaper wines are crap, while more expensive wines are a waste of money. It doesn’t matter where the price point is. People who buy $5 bottles of wine think $3 wine is crap, while people who buy $50 bottles of wine think $100 bottles of wine are a waste of money. Do you see yourself here? I do, even though my price-comfort range is wider than most people’s because I taste so much wine. There are only a few wines under about $9 that I don’t consider plonk (Vinho Verde is the major exception). I’m not sure what my upper limit is, because I get to taste expensive wines all the time, and some of them are great. Yet I was on the Sine Qua Non mailing list for a while, but dropped off because I realized that savvy purchasing would get me wines I liked as well for much less money. This price-classification turns the traditional 4 P’s of marketing -- price, product, promotion and placement -- on its head. With most products, the product itself is the most important thing. If you buy Crest toothpaste, you’ll stick with it even if Pepsodent is 25 cents cheaper; maybe even if it’s a dollar cheaper. But few wine consumers are brand-loyal. If someone’s favorite Argentine Malbec is $10.99 and there’s one from the same region for $9.99 next to it, he’ll try the cheaper one. But if there’s also one for $6.99, he’s likely to sneer at it as plonk. 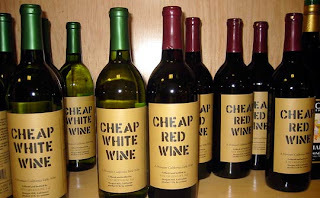 The exceptions to the absence of brand loyalty tend to be drinkers of the cheapest wines. Beringer White Zinfandel fans feel about Sutter Home White Zin the way Ford buyers feel about Chevys. And Almaden and Carlo Rossi drinkers are also very loyal: they’ve find their drink, and they’re sticking with it. We wine lovers don’t often think of Carlo Rossi drinkers as part of our gang, but they are: only 61% of American adults drink any wine at all, ever. Moreover, 80% of American wine consumption comes from just 17% of the population. As wine sales are continuing unabated throughout the Great Recession, that means some of us are doing a whole lot of consuming to keep the wine industry afloat. Moreover, because many of us are not brand-loyal, we’re spreading our support around. Aren’t we generous? Just don’t try selling us any of that half-price plonk or those overpriced ripoffs. We know the best wines are all priced just right. Here's complete disclosure: I'm in Spain, where I'm drinking liters of great wine, yet I just spent half an hour searching through my tasting notes for an Italian wine I liked recently. Why? My advertising deal with Wine Chateau (check out the display ad on the upper right), gives my readers a shipping discount, but the Internet wine discounter chooses the words the discount links to. This month, those words are "Italian wine." Fortunately, last month I tried Inama's Soaves and was favorably surprised by what Stefano Inama is doing in a region I had long associated with relatively characterless whites. I first opened his Inama Soave Classico 2008 ($17) when I was having a big platter of sashimi but felt like wine rather than sake. It didn't disappoint: it was crisp and lively, with good stone fruit, and was a great palate cleanser. He also makes an Inama Vigneti di Foscarino Soave Classico 2007 ($26) from old Garganega vines on top of Mount Foscarino that's intense, with aromas of pineapple and gravel, and flavors of pungent passion fruit, a medium-weight mouthfeel, and vibrant acidity. This wine surprised me, as I didn't think Soave got this intense; shows what I know about Soave. I'm glad I didn't open this wine with sashimi. I had it with clam pasta, and it was just fine. Both wines are available from Wine Chateau, and my readers get a shipping discount on any wines at all, whether or not it's Italian wine - Get 1/2 off shipping of 6 or more bottles with coupon code "blake29". As the cool counter-cultural bands I used to see at bars around my university said, don't forget to tip your waitress. Picking grapes is hard work. There’s some skill involved, as I learned when I tried it myself. But mainly, it’s back-breaking labor and it pays poorly. You won’t find many Americans picking wine grapes, or harvesting any other kind of fruit or vegetable. The California wine industry needs hundreds of itinerant workers, mostly Mexican, to get the grapes off the vine and into the wineries. This is not unique to the US. In Spain, many harvest workers are from Poland. In Israel, grape pickers come from Thailand. Nobody wants to pick grapes for a living unless they’re economically desperate. 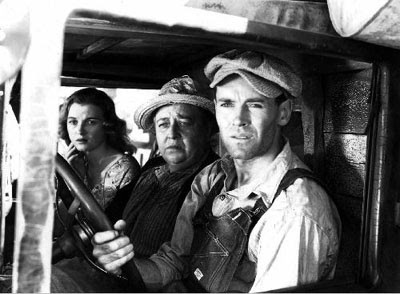 The immigration debate mostly ignores the realities of harvest work that have changed little since John Steinbeck wrote “The Grapes of Wrath” in 1939. Then, California grape growers took advantage of displaced Dust Bowl refugees to get other Americans cheap grapes. Americans were horrified by the conditions depicted in the book and film, but didn't volunteer to pay more for grapes. It took the United Farm Workers union several strikes to get labor-protection laws that made the job more humane. Not coincidentally, grape growers starting hiring more illegal immigrants not long after, and grape prices stayed low. There aren’t as many illegal pickers in Napa and Sonoma Counties as you might think. Grapes fetch a premium there and wages are good enough to attract permanent residents -- though not good enough in most cases for them to live outside of dormitories. But as a nation, we would not produce many under-$10 bottles of wine without illegal immigrant pickers. You probably expect me to launch into another attack on the new Arizona immigration law. But I’m not going to. I understand why Arizonans wanted this law, which basically just allows local cops to ask people for their papers. The East Coast media’s hysterical overreaction to the law annoys me more than the law itself, because it’s typical of the polarized immigration debate in this country. Now the Arizona law is being discussed from the same entrenched positions. The East Coast media -- you don’t see a lot of truckloads of border-jumpers in Boston -- is beating a drum for a boycott of Arizona Diamondbacks games, while the Rush Limbaugh types want everyone with a Spanish accent tossed in a prison camp in the desert, where they’ll be forced to wear pink underpants. What we need -- and haven’t had -- is a rational, apolitical discussion of immigration. And grape picking is as good a place to start as any. I am a huge advocate of legal immigration. This is a nation of immigrants, and unless your last name is Running Horse, your ancestors were immigrants too. Immigrants are the reason for our vitality; they come in hungry and eager to prove themselves, and have for generations. Whether it’s computer science or fusion cuisine, it’s hard to name an area of our national economy that has not been enriched by first-generation immigrants. We need more immigrants, millions more. But they should be legal. They should be subject to our laws and welcome to our privileges. They should apply and be chosen. They should have traceable IDs, not stolen identities. They should be willing to wait their turn for legal entry -- which they’re not currently doing because of our ridiculous immigration policies. The reason Central Americans are paying Mexicans thousands of dollars to transport them across a hostile border is because of our need. If we didn’t need them, we wouldn’t hire them, and they wouldn’t come. But we do need them, so they stream over the border like air rushing into a vacuum. Back to grape picking for a moment. Why would somebody from Michoacan risk crossing the border if there was no work picking grapes in Fresno? If Americans would do the work, he would not come, because he would lose money on the trip. But we won’t, and he will. However, because of our irrational immigration system, he can’t get car insurance, so if he hits somebody, they’re screwed. He can’t get health insurance, so if he gets cut with a machete, he has to use the emergency room and we pay for it. People on the right complain about the symptoms. People on the left want to pay the bills and give him a hug and a green card. Nobody addresses the cause. We need more immigrants! We need to acknowledge that, and set up a rational system that will stop rewarding lawbreakers. If a law-abiding man from Michoacan were to apply at the US Embassy in Mexico City for a visa to pick grapes, they would laugh in his face. So what’s he to do: break the law, or stay home? That’s the choice we give the workers we need. Much of my disgust with the liberal media on this issue comes from having been a legal immigrant myself, and being married to a legal immigrant today. Do you know how much more difficult it is to become a legal immigrant since 9/11? You don’t, do you? I don’t blame you: the media isn’t interested in the issue. And that is a huge part of the problem. When newspapers write stories about immigration, they are inevitably sob stories about some lawbreaker: somebody who has been in the country illegally for 15 years and is about to be deported because of a misdemeanor. We’re supposed to weep for this person. I’ve been to more than 40 countries, have lived in three, and have never overstayed a visa, so I have little sympathy for the usually pathetic excuses. No wonder conservative talk show hosts mock these stories. But that guy in South Korea with an engineering degree who’s been on a waiting list for five years for a visa, and hasn’t come because he’s the type who obeys laws? There’s never a story about him. Liberals don’t care because he’s not an illegal immigrant. Conservatives don’t care because they don’t want more immigrants anyway. So he waits and waits while less law-abiding people jump the line. Back to grape pickers: We need a category of visas for guest workers; fruit pickers are a perfect example. They should permit multiple entries and be renewable. If someone keeps coming -- and going back on time -- for 5 years without any criminal activity, they should be able to get a higher level of green card. Most guest worker proposals I’ve seen have a time limit, after which they’re not allowed to return. That’s silly. Guest workers should be treated like probationary workers in a company. If they’re good at picking fruit, they are hard workers by definition, and they will be good for this nation. If conservatives don’t like it, I suggest they get out to California and pick grapes, even for one day. Just because anybody can do a job doesn’t mean anybody will do it. For my parting shot, I want everybody who has a position on this issue to tell me the average amount you spend for a bottle of wine. If it’s over $20, then it can be harvested by permanent fulltime workers. Hopefully everybody who thinks the Arizona immigration law is a good idea is spending this much money on wine. If your average wine costs $10 or less, you are encouraging the illegal immigrant labor flow. You need to be against the Arizona law. Are you?